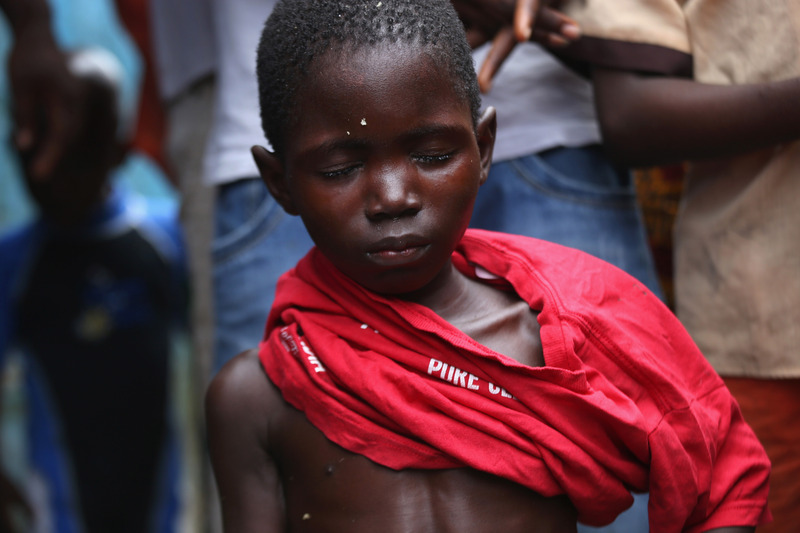 Local residents dress a sick Saah Exco, 10, after bathing him in a back alley of the West Point slum on August 19, 2014 in Monrovia, Liberia. According to a community organizer, Saah’s mother died of suspected but untested Ebola in West Point before he was brought to the isolation center on the evening of August 13th with his brother Tamba, 6, aunt Ma Hawa, and cousins. His brother died on August 15th. Saah fled the center that same day with several other patients before it was overrun by a mob of slum residents on August 16th. Once out in the neighborhood, Saah was not sheltered, as he was suspected of having Ebola, so he’s been sleeping outside. Residents reportedly began giving him medication, a drip, and oral rehydration liquids today. The whereabouts and condition of his aunt and cousins, who left the facility when it was overrun by the mob, is still unknown at this time. The Ebola virus has killed more than 1,000 people in four African nations, more in Liberia than any other country. Photo by John Moore/Getty Images. View Alan Taylor’s heartbreaking gallery of images from the Liberian Ebola crisis here.